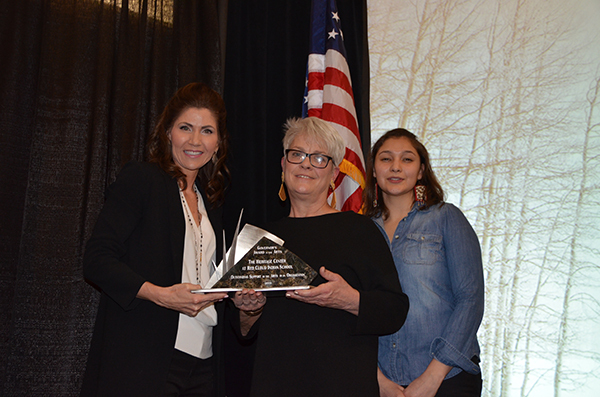 Governor Kristi Noem presents The Heritage Center with the South Dakota Governor’s Award in the Arts. The heart of The Heritage Center’s mission is celebrating all Native artists and their work. So we were thrilled to learn that The Heritage Center would be honored for just that—standing as an advocate for generations of Native artists and for the Native arts community across the state. The Heritage Center’s Director and Curator, Mary Maxon and Ashley Pourier ‘08, traveled to the capitol in Pierre to celebrate at an awards banquet, alongside many of the state’s fine artists and arts leaders. Accepting the award on behalf of The Heritage Center, Maxon reflected on the importance of art and artists, particularly in indigenous communities.